Twelve years ago my wife and I purchased a 2000 Nissan Maxima 4 door sedan to replace our Toyota hatchback whose low profile and bucket seats I could no longer access due to a right full hip replacement. I mention this because I’m recovering from my second hip replacement. (Yes, I have osteo arthritis.) In early March 2012, I had my left hip replaced. Though the operation today is pretty much the same, twelve years ago patients with full hip replacements were required to walk with crutches for 6 weeks, never allowing the foot of the operated leg to touch the ground. Within a few days of my most recent operation, I was walking with the aid of a cane. Just outside the operating room while I was waiting for my anesthetic, I overheard a critique of my surgeon crediting him with regularly performing 7 hip replacements in one day. From the tone of their voices, I took this to be high praise, but wasn’t sure if it was for speed, competency or both. As I understand it, the surgical process goes something like this. A deep 12 inch incision is made on the outside of the patients thigh, the surgeon reaches in, dislocates the hip, saws off the ball joint, hammers a metal spike into the femur, pops in the new ball joint and plastic liner and voila! Twelve years ago I was administered a general anesthetic and I could hardly get myself out of bed the next day, or the next or the next. Getting up is mandatory therapy to prevent the formation of blood clots. This time around my wife and the hospital staff convinced me to undergo a spinal anesthetic and the results were considerably different. There was a smooth, almost unnoticeable transition from sleep to wake, pain to no pain and getting out of bed the next morning was done without assistance. With the aid of a walker I took my first steps almost effortlessly into the hallway outside my room and back. As before, pain was managed with a morphine drip and oxycodone. Twelve years ago I played a round of golf about 2 weeks after coming off the crutches – getting around using an electric golf cart. This time I don’t know what to expect. A few months ago I gave my grandson my golf clubs, bag, shoes, rain gear, gloves and balls. He’s an athletic guy – hockey, basketball, soccer and baseball. If I can play golf, I’ll rent a few clubs and play with him. So, four weeks into my six week recovery period, how am I doing ? There are good days and bad. Well, I shouldn’t say bad. The pain is quite manageable so I’m hoarding my oxycodone for some expected but unknown future pain. I’m listening to audiobooks and watching golf contests in preparation for the Masters tournament in Augusta, GA. Tiger won last week and that plus limited ads, puts a bit more interest into the Masters tournament. Besides, my grand children gave me a new LED, HD, 55″ Samsung Smart Television. I can now see all the putts and follow all the flights of the balls. 1. You’ll need a bath tub seat and a screw on handle to assist you getting in and out of the tub. 2. Also helpful is a “grabber”. This long light weight implement allows you to pick up socks, towels, even tooth picks without bending over and breaking the 90 degree rule – the angle between your torso and hip. 3. A seat that raises the height of your normal toilet seat. This also maintains the 90 degree rule. 5. A plastic device which allows you to put on socks without breaking the 90 degree rule. If needed you can find elastic shoelaces for laced shoes. 7. Twelve years ago I participated in a blind test of new orthopedic technology from Germany. 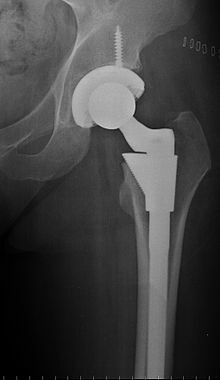 At the time it was simply called “metal on metal” and the hip replacement patients were not told if they were receiving traditional replacements or the German “metal on metal”. I got the he German hip. 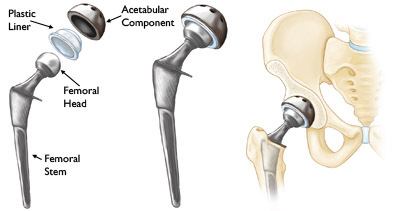 If memory serves, my femoral stem was titanium and the rest, stainless steel. This time the stem was titanium, but unlike my first, it had holes which fostered more rapid bone adherence and growth. P.S. While Working on this article I was reminded of the rock group the “Tragically Hip” and I found on You Tube what appears to me to be a country-western band called the “Hip Replacements”. The guys in the band looked to be middle-aged, salt-and-pepper beard’s and cowboy hats. Oh, one more thing for my friends and relatives in the United States. All of the expenses for both my hip replacements including a semiprivate room and 150 oxycodone, were covered by tax contributions made by me and the 30 million Canadians who believe in Canada’s universal health care system whose premise holds the primary purpose of government to be the welfare of its citizens. You always were a hip dude, now I suppose you’re a double hip dude. The responce to “A HIP ADVENTURE ” says, your comment is awairing moderation – what the hell does that mean? So glad you’re doing well. From your fine description, it almost makes me look forward to having mine done……in CANADA, of course! John Bergamo wrote a new piece “Totally Hip” during his recovery. Any new music as part of your therapy? Hi Jim – Another friend said I was now Too Hip. Well, when it was suggested he use a more modern percussion instrument to replace an old “clunker”, John Cage said, “That’s too dramatic”. Perhaps I could write a short one act opera about a man with two artificial hips who enters an immigration scanner and never finds a way out. Would you do the music? It would be my pleasure Sir Robin!